Google+ isn't the most populated social network out there, but its Year in Review is now more sophisticated than the popular Facebook feature of the same name. That's because the search engine giant is using its Auto Awesome technology to piece together both memorable photos and video you have backed up through Google+. "This time of year we reconnect with loved ones, and we reflect on the moments that really matter," wrote Anil Sabharwal, lead product manager at Google Photos, in a Google+ post. 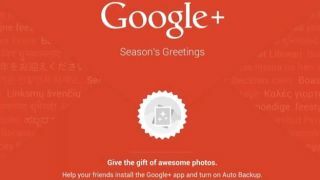 "Many people have been saving and sharing their photos and videos on Google+ all year long. And for those select users we've got one more holiday gift: an #AutoAwesome year in review." Sabharwal made a point in saying that Year in Review sources its AutoAwesome photos and videos from Google+ Auto Backups feature, but it's never public unless you share it. "In all cases these gifted items appear in your account automatically," he noted. "As long as you're backing things up to Google+, you'll get notified whenever an awesome (and private) version is ready to share." Active Google+ users who have Auto Backup turned on will be notified in the "next week or so" as to whether they'll be able to watch movie memories curated by Google's algorithms. Read: Twitter has a Year in Review feature too that highlights top tweets, trends.